SEGGER SystemView is a real-time recording and visualization tool that reveals the true runtime behavior of an application, going far deeper than the insight provided by debuggers. This is particularly effective when developing and working with complex systems comprising multiple threads and interrupts: SystemView can ensure a system performs as designed, can track down inefficiencies, and show unintended interactions and resource conflicts. In other words and simply stated, this tools allows you to find out the true runtime behavior of applications running on your computer and detect source that can negatively impact the performance of your computer. SEGGER SystemView is an advanced application that provides you with the tools to minutely examine and understand the runtime behavior of applications installed on your computer so that you can identify resource conflicts, interruptions and other inefficiencies. You should know that the application works on systems that support the J-Link RTT technology, meaning that it should be able to read memory via the debug interface during program execution. The idea behind the program is to allow you to record data from the target system while it is running, information that can be valuable for projects that entail managing complex environments with numerous events and multiple threads. The app comes with single-shoot and continuous recording modes that you can switch between depending on the nature of your app. The post-mortem analysis is a third recording option designed to overwrite older events and present the newest events available. While you can preview the data in a different window, you should know that you can also save the recording for later analysis. You can store the log in an SVDat format and hence, you cannot analyze it via other third-party software solutions. The utility enables you to detect and hence, try to correct conflicts resulting from resources interactions via the Event window. In fact, you can preview a very detailed log featuring the context, description, parameters, ID and timestamp with all events that have occurred during the recording. In case you want more details about the system activity by context, then you can access the timeline window and preview the tasks, interrupts, scheduler, time and idle time for the application you are monitoring. Therefore, it can help you identify inefficiencies and issues that can cause conflicts or affect the system performance. 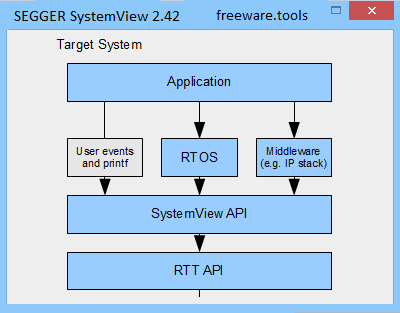 In the eventuality that you would like to be able to analyze the runtime behaviors of the applications you are developing and make sure that there are no conflicts due to resources or unintentional interactions, then perhaps SEGGER SystemView could lend you a hand.